Narrenbäume - the book - Wilhelm W. Reinke bei Kunst ist! 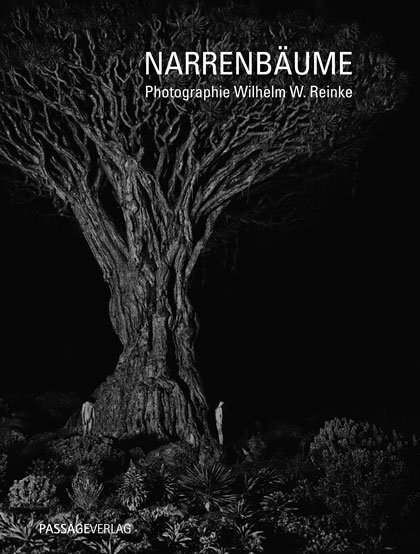 In the book NARRENBÄUME, Wil­helm W. Reinke ad­dresses the am­bigu­­ous re­la­­tion­­ship between human and nature. Naked people are some­­times in a unity and some­­times in con­­trast to ex­­­press­ive trees - as a sym­bol of pure nature. In the re­la­­tion­­ship of human bee­ings to nature, the tree has al­ways played a sym­bol­ic role, just think of the "tree of know­ledge" or the concept of the "fam­ily tree". People who live sur­roun­­ded by trees are hap­pi­er, health­i­er and live longer. Trees provide shade, im­­prove the cli­mate and en­­rich the body and mind. Hu­­mans as a "fool" are des­­troy­ing the di­versity of the hab­it­at tree and nature. These thoughts were taken up in the photo pro­­duc­­tion and in the end are in­­ten­ded to stim­u­late the view­er to re­­con­­sider his be­ha­vi­or to­wards nature at least for a mo­­ment. In the con­­trasts light and shad­ow, black and white, light and dark, the "light paint­er" Reinke shows the mu­tu­al as­­sign­­ment of these con­­nec­­tions. The idea of "not eat­ing out of the tree of know­ledge" should be in­­ter­­­preted fur­th­er today, "to no longer con­­sume it - and thus nature - but to pro­tect it and mul­­tiply it again." The pho­­tos were taken in di­f­fer­­ent places around the world, such as Mad­a­­gas­­car, Spain, Ger­­­many, Italy, Aus­tria, France, USA and In­­done­sia. Among the trees shown in­­clude u.a. maple, birch, pear, beech, ginkgo, but also exot­ics such as baobab, giant se­quoia, date palm, cypress, dragon tree, eu­­ca­lyptus, fig and even two-thou­sand-year-old olive trees.